There are many varying opinions in the strength and conditioning world, but when it comes to off-season training program design, the coaches with the highest levels of experience can agree on most main things. Outside of the obvious things such as the training principles we should all be aware of, which are deeply rooted in the scientific literature, there can be some grey area between coaches to where a certain coach’s perspective on the application of what is currently available in the research in combination with their own personal experiences differs from one another. The following 5 sections are the main mistakes I personally see trainers advocating on a yearly basis around the off-season that need to die. Mobility has somewhat become a buzzword on social media these days and seems to have gained popularity only in the past 3-5 years or so. Which is kind of funny, all of a sudden everybody from your average couch potato to an NHL all-star should be on a full mobility system. How come not before then, there was plenty of research? I believe its popularity, along with activation work, is somewhat of a fad. Sure, mobility and activation have their place and can be effective. But, does everybody need it? When we talk “mobility” though, it’s kind of a tough thing to define, isn’t it? Flexibility is a part of the equation because you need to have proper flexibility in order to perform the full range of motion through a given task. Therefore, if you have flexibility issues it can either positively or negatively affect your mobility. Technique is a part of the equation because a person’s technical skill may be poor enough as to present itself as an issue of mobility. For example, many people when in the hole of a squat (below parallel) tend to also bend over at the upper body and come out of the hole kind of in a squat / good morning motion. Mobility guys might jump all over this and look for tightness’s in the posterior chain, when all the client might need is some proper technical coaching. Lastly, strength plays a large role in the topic of mobility because it is strength that is allowing you to remain stable throughout a range of motion. If you’re not strong enough to keep a fully postured back throughout a deep squat then that is a strength issue, not a flexibility issue. In another example, if you can’t lie on your back, extend your legs perpendicular with the ground and touch your toes this may be a weakness in the abdominals in order to bring your upper body off the ground, and not a tightness in the back preventing you from moving. Now that the intersections of mobility are a little clearer we can talk about the most important principle of all the principles of training, which is the principle of specificity. Specificity is the principle of training that states that sports training should be relevant and appropriate to the sport for which the individual is training in order to produce a transferable training effect. 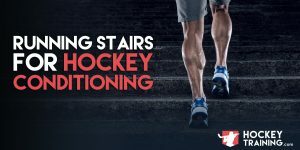 Meaning, anything and everything you do in and out of the gym in the form of exercise should be connected to improving your hockey performance in some way. In a far out example of an improper use of training specificity, you would be a power lifter running marathons in order to get better at power lifting. Of course this doesn’t make sense, it is not specific to the sport and therefore lacks training specificity. This also goes for mobility. Mobility routines demand specificity just like your weight training and speed work would. The biggest mistake I see in hockey mobility work is that so many coaches think more is better. Mobility is totally sport specific just like your training is. Do hockey players need to be as mobile as gymnasts? Should hockey players be more mobile than a power lifter? 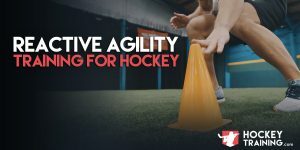 You’ve seen me talk about mobility in the past in reference to speed development for hockey players, BUT, what you didn’t hear me say is “more is better”. Because more is not better, more can actually be worse. Sprinters lower body’s are actually quite tight and this plays to their advantage because these athletes are loaded like springs. Same goes for power lifters, it is actually advantageous for a power lifter to be tight (within reason obviously) as opposed to super loose. Now as a strength and conditioning coach, would it be wise of me to loosen up the sprinter and power lifter to the extent of a gymnast? Because that is not specific to their sport and can have negative outcomes. Same rules apply to hockey players. If you’re one of these players who is focusing way too much on total body super mobility, you are only going to be getting better at mobility, not at hockey. When in hockey are you going to need to be crazy flexible? Goalies aside — probably never. This is also important for time management. If you can only spend 4-6hrs per week on your off-ice hockey development and you’re doing a half hour of “Mobility and activation” drills prior to every workout — you are not wisely using your time. This time could be better used doing more strength work, conditioning work, or skill work. Once you have adequate mobility for hockey you need not reach for the stars in the world of mobility. It’s incredibly important for hockey players to keep track of their progress and set goals for themselves throughout the off-season, I make this crystal clear within the quick-start guides in our hockey training programs. But it is harder for a hockey player to totally gauge what is going on outside of videotaping your performance or getting your coaches feedback. Hockey is chaos. There are so many variables constantly at play on the ice at all times of the game that the scorecard is not always the tell-all of how well you played. There are plenty of great hockey players a team would never want to give up that don’t light up the scorecard on a regular basis. This is one of the reasons why I believe it is so important that hockey players (in addition to their coaches feedback) use physical performance parameters as well to gauge their level of improvement — some examples would include 1-RM strength testing, speed times, distances covered for endurance, body fat percentage throughout a diet, resting heart rate measurement for recovery status, etc. These are visual, solid parameters that you can see and feel. Tracking your sets, reps, weight, sprint times, and everything else allows you to see where you were and how far you have come (and what you still need to work on!). This can have a major impact on your confidence levels which can then express itself on the ice. Something a scorecard might only do every now and then. I have beaten this to death in every program I have made and every blog post I have made and I’m going to do it again. Way too many hockey players get excited only about the training process and completely blow it on the nutrition end. And by blow it I mean BLOW IT, I don’t just mean it’s a neutral effect. They go backwards because their nutrition is so terribly misguided. These approaches (if they can even be called that) will only get you as far as they can, which normally isn’t very far. This is normally when guy’s weight change (either up or down) stalls and those massive strength gains you were seeing in the beginning of your training plan come to a halt. In order to make serious progress from your training you have to put the same amount of effort into your eating and anybody who has done this in the past will tell you this as well. There’s no way around it. The results come much faster and more permanent when you’re eating a meal plan designed for you and your goals. This comes down to proper stimulus recovery adaptation. When you’re in the gym you are only creating a stimulus for muscle growth, endurance, or strength. It’s how well you recover from that exercise bout that determines how well you are going to gain those attributes. For example, if you perform a muscle building program for 6 weeks but eat like crap, you decreased the potential at which you could have otherwise put on muscle during that time. Training hard is the fun part, everybody loves to train. Eating right is the harder part, but it is what is ultimately going to determine your results. Nobody ever out-trained a bad diet, it has an undefeated record. This is a common yet avoidable problem. By pin balling, I am referring to bouncing from one program to the next with no real methodical approach to it. This is totally fine for general population. General population can do whatever they want. If they’re just there to get a health benefit they need not the customized yearly periodized training structure of a hockey athlete. But if you’re an athlete, your periodization structure should be sound and good to go with laid out goals for each phase that make sense both where they are placed in the year’s schedule but also to how it is going to transfer on the ice. Going from one magazine program that looks cool to another online program that looks cool doesn’t make sense from a sport science perspective. What an athlete needs is training systems designed to elevate their game that are connected to one another as the training systems continue to build upon your continued progress. You can look at doing random program design throughout the year like building your own car from the junk yard. You have to go out and get different pieces from different models and in the end you might actually get the engine to run. Now compare that to a Roll’s Royce made entirely in house by hand with premium parts. Who’s going to perform better in the end? The car that was put together randomly from random scraps, or the methodically designed Roll’s Royce? This goes hand in hand with pin balling. Actually a lot of qualities do. Not focusing on strength at the right times. Not focusing on hypertrophy at the right times. Not properly peaking for the next season, try-outs or hockey camp. Starting your off-season training too late. The list could go on but probably the biggest offender I see in hockey training is not focusing enough on strength and hypertrophy once the off-season kicks off. In-season hockey is not easy on the body. It is a very high-impact sport and going through a tough season can take a toll on the body. A typical season consists of lots of practices, games, travelling, and training even on top of all of that — which can leave both the body and mind a little worn down. After a quick recovery period with maybe some short time off after the season hockey athletes should be diving right into the hypertrophy and strength work. Now, when you decide to begin depends on how much wear and tear you have on your body. If you’re beat up, take a little time off. But if you’re good to go, just a week or so off will be more than enough and you will have a head start on your competition in your off-season development. Why jump in to the hypertrophy and strength work? Because this is the time at which you are the furthest away from another season of competition. It would be impossible to both play the game well and focus on strength and hypertrophy at the same time. Our number one focus for you during the season is performance. Number two is the maintenance of your current strength, power, conditioning and muscle mass. Hence the maintenance part, during the season too much is going on for you to fully recover from hard strength and hypertrophy training. So, if we know that during the season is entirely about maintenance and performance, where do we get better? Off-season is prime time physical (not skill) development for hockey players and any hockey player who isn’t completely jumping all over that is missing a huge opportunity. First things first in the off-season is to train and train hard because you can maximally recover from that and not have to worry about it affecting your performance on the ice. The first 1-4 phases (depending on when you start your off-season and how long your phase are) should have a primary emphasis on strength, hypertrophy and structural balance. Then as the off-season progresses a greater emphasis is placed on speed development, power and conditioning as you peak and come into the next season or tryouts ready to rock. The main take away point from this 5th mistake is that you should not look at your hockey development and your strength + conditioning as different entities, but rather, extensions of one another. Your ability to be a good hockey player is almost entirely about your skills on the ice and your teams’ strategy and tactics. But, your ability to effectively use these skills and execute them explosively and powerfully throughout the full duration of the game is entirely dependent on your strength and conditioning. One is not without the other, they are extensions of one another and how well you are able to bridge this gap is dependent upon how intelligently you train. 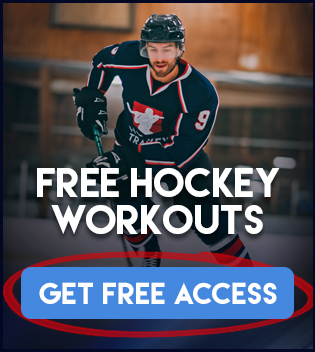 If you want access to our off-season training programs visit this page: http://www.HockeyTraining.com/Programs/ where you will find our full training program, conditioning program, and hockey speed ebook. This is great info.Some of the best I have seen in years,keep up the great work.